Don't want to transport mountain bikes? No Problem! Show up for daily tours at Sweetwater Preserve, $99 a bike, bike as long as you like! Show up and we provide bikes, helmets, pedals and spare tubes! We take care of everything! Mountain Bike 1 hour or all day! Text us when you are done, we pickup! Great for riders of all levels! Check Our Our Tucson Bike Tours on YouTube! Brian tells you about splendid beauty, desert fun and Arizona’s best mountain biking. 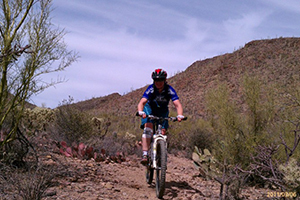 Tucson Heather Lowe is one of the state’s top road and mountain bike guides. Bike The Loop Path in Oro Valley! There is nothing like sightseeing Tucson on a road or a hybrid bike! Oro Valley, Arizona is the “crown jewel” of great leisure road biking. Just meet us in Oro Valley on The Loop Bike Path and bike as long as you want. Bike amidst the stunning Catalinas and enjoy America’s greatest biking path. Just $59 for adults and $49 for kids! Bike one hour or all day. 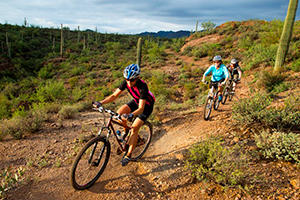 Discover Tucson on a bike! Bike Tours Are Family Friendly! Bring the Kids! Get rid of the video games, devices and nonsense and go biking! Your kids will have a fun, safe time while getting some sun! Call us to book a tour and your kids will thank you. Have your kids discover the joy of biking on The Loop or doing some easy trail riding on a mountain bike. Don’t want to transport mountain bikes? No Problem! Show up for daily tours at HoneyBee Canyon, $85 a bike, bike as long as you like!